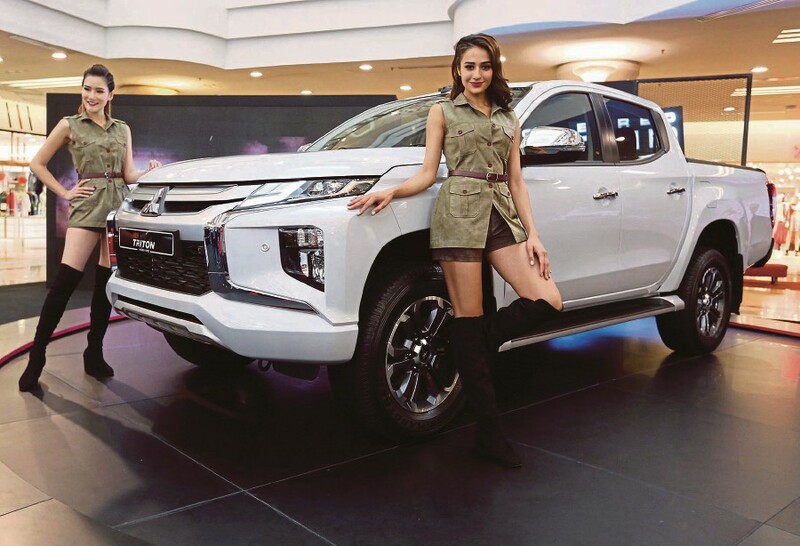 MITSUBISHI Motors Malaysia (MMM), the official distributor of Mitsubishi vehicles in Malaysia, has launched the new Mitsubishi Triton with a starting price from RM100,200. There are five variants available: the Triton MT, AT, MT Premium, AT Premium and Adventure X. All variants are powered by a 2.4-litre Mivec turbo diesel commonrail VGT intercooler engine, mated to either a six-speed automatic with sport mode, or a six-speed manual with 179hp at 3,500rpm and 430 Nm of torque at 2,500rpm. The Triton measures in at 5,305mm in length, 1,815mm in width, 1,795mm in height for the Adventure X and AT Premium variants (1,780mm for the rest of the variants), as well as a wheelbase of 3,000mm. It weighs 2,870kg and has 75 litres of boot space. The MT and AT variants are equipped with 16-inch alloy wheels, Easy Select 4WD drivetrain system, halogen projector headlamps with manual leveling function, halogen daytime running lights, rear fog lamp, rear step bumper, manual adjusted side mirrors, side steps, back-lit instrument cluster, manual air-conditioning system, 2-din CD, MP3 USB player, four-speaker sound system, one usb port, power windows, and fabric seats with manual adjustment for the front driver and passenger. Moving up to the MT Premium variant upgrades, such as 17-inch dual-tone alloy wheels, front fog lamps, power adjusted chrome side mirrors with turn indicators, push start ignition, high contrast standard instrument cluster, auto-dimming rear view mirror, touch screen and voice command entertainment system, six-speaker sound system, three USB ports, smart phone storage, digital auto air-conditioning system, rear individual vents, multi-function leather steering, cruise control, front leather knee pads, and auto lock doors with speed sensing, are thrown in on top of the standard features. The AT Premium variant has 18-inch dual-tone alloy wheels and high-contrast instrument cluster with colour, compared with the MT Premium variant’s equipment list. The range-topping Adventure X is fitted with Super Select 4WD-II drivetrain system with off-road mode, auto Bi-LED projector headlamps, LED daytime running lights, auto wipers, touch screen with voice command, Apple CarPlay and Android Auto ready entertainment system, paddle shifters, and power adjusted leather seat for the driver (manual adjusted for the passenger). In terms of safety features, all variants are equipped with anti-lock braking system, electronic brakeforce distribution, brake assist, active stability control, traction control, brake override system, hill start assist, trailer stability assist, rear parking sensors, high mount LED stop lamp, driver seat belt reminder and ISOFIX child seat anchor points. The MT Premium, AT Premium and Adventure X have an additional reverse camera with guide lines, while the AT Premium and Adventure X have rest reminder and hill descent control functions. The Adventure X variant comes with exclusive Mitsubishi Advanced safety features, which include forward collision mitigation with warning and autonomous emergency braking function, blind spot warning, lane change assist, rear cross traffic alert, auto high beam and ultrasonic misacceleration mitigation system. Apart from that, the Adventure X also has seatbelt reminder for driver and passenger, front parking sensors and seven SRS airbags (two airbags for the other variants). The completely built up (CBU) Triton MT is priced at RM100,200, while the AT is RM105,990. The MT Premium is retailed at RM112,500 and the AT Premium carries a price tag of RM118,600. As for the Adventure X, it is priced at RM135,200. All prices are on-the-road price, excluding insurance. All Triton are covered by a five-year or 200,000km whichever comes first warranty. As an introductory offer, the first 1,000 customers will receive an exclusive limited edition Thule Subterra luggage worth RM2,000.